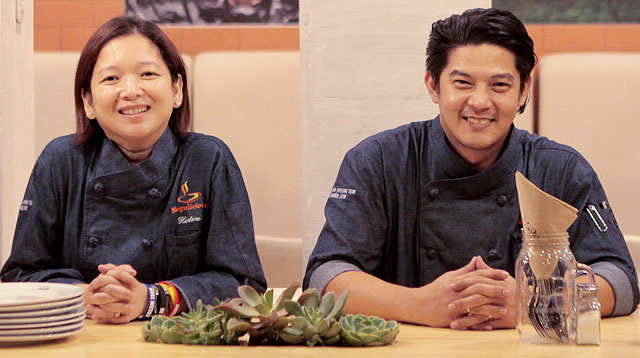 We thought we’ve seen it all when it comes to well-thought-out spaces for rent—from Scandinavian-inspired condos to spaces filled with teddy bears—the owners go the extra mile to make sure guests will have a memorable stay. 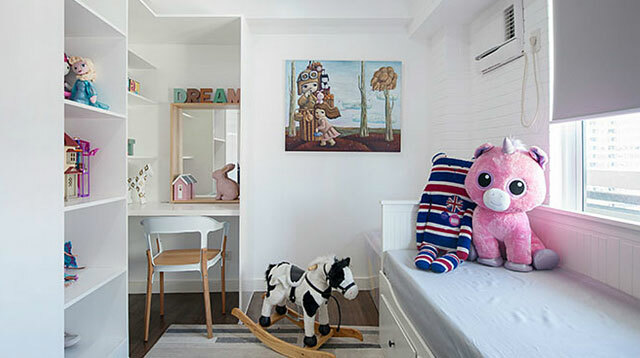 Motivated by the same objective, the team behind Sky Suites PH came up with themed suites that will delight kids and the young-at-heart. 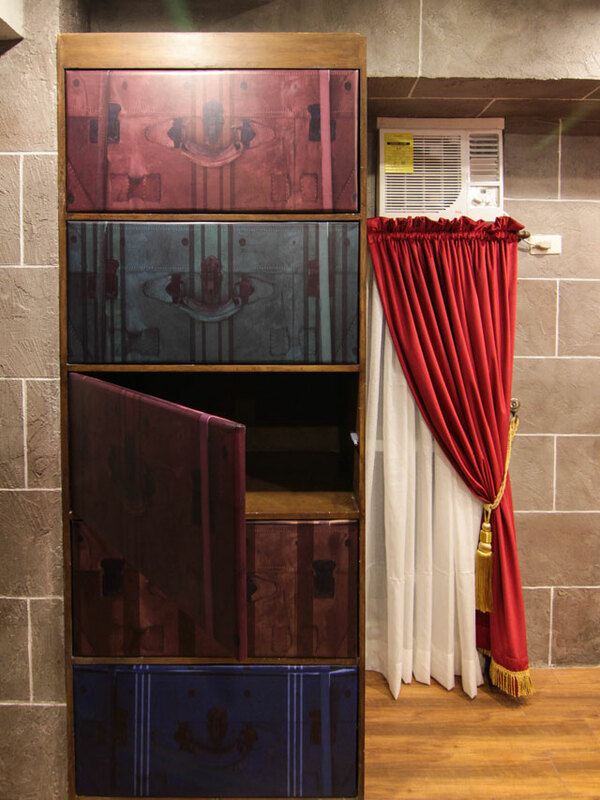 With the help of Madhouse Design Studio, they transformed a 55sqm suite into a whimsical escape reminiscent of the magical world of Harry Potter. 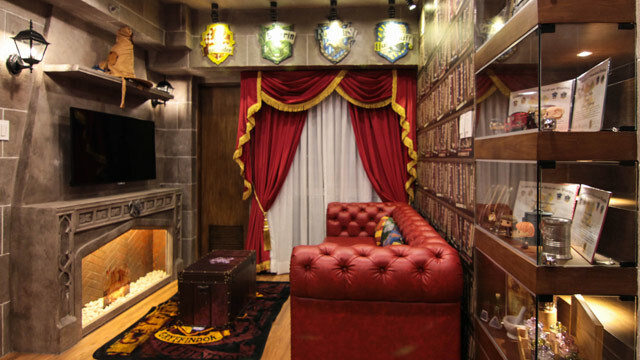 Taking inspiration from the themes showcased in the movies, the design team created amazing nooks within the suite that pay homage to the wizarding world. “We made sure to create it in a way that guests would have an unforgettable Harry Potter experience. Each detail in the unit is custom-made and unique, all of which were handmade on site. 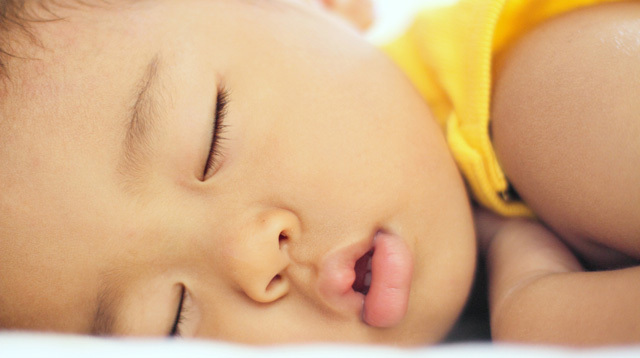 The client required that at least six to eight people can stay in the unit. We did our best to accommodate this request by adding a sofa bed in the living area,” shares Gila Salvador, creative director of Madhouse Design Studio. Given the magnitude of Harry Potter’s world, it was challenging to include as many elements as possible given the size of the suite. “There wasn’t enough space to pack in all the ideas from the movies. I don’t know if you could tell, but I’m a Potterhead myself so I wanted to incorporate as much themes as I could in the space. 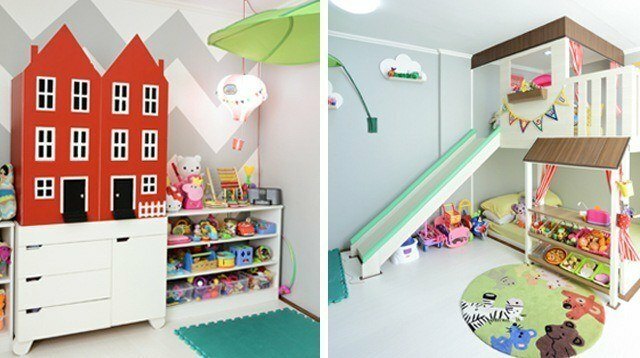 The clients simply said it was whimsical, magical, and it was better than what they had in mind,” she adds. 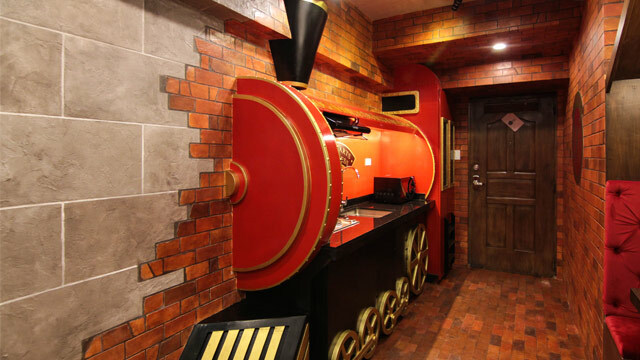 From the suite's door, guests will be greeted by a mini Hogwarts Express. 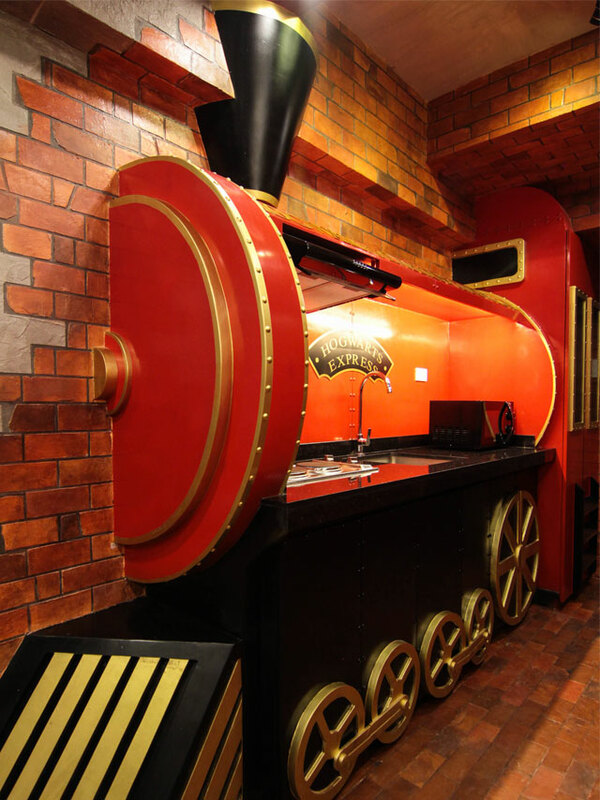 "We wanted to add a Hogwarts Express concept into the unit so we created a train-themed kitchen," says Gila. The area is enveloped in warmth, as seen in the chosen colors and brick wallpaper. Instead of covering the entire wall with a brick pattern, the design team showcased a transition from bricks to a cement-like wall that creates a feeling of movement and transition. "Since it's the first thing you see, it'll feel like you're getting off Platform 9¾ and off to Hogwarts," she adds. A wall accent showing the famous platform can be seen in front of the cooking area. Though compact, visitors can use the kitchen when prepping meals as it has a sink, small appliances, and a stove. Madhouse Design Studio paid attention to details—just check out those wheels! 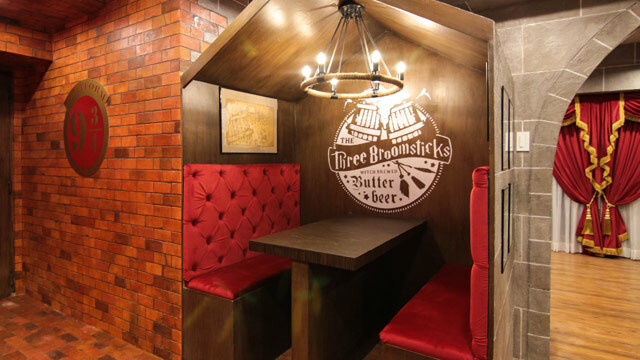 If you're a fan of the book and movies, you'll surely be familiar with The Three Broomsticks. "It's where Harry, Ron, and Hermione hang out and drink butterbeer," Gila explains. The design team thought of using the Inn as inspiration for the dining area and came up with a booth-like nook where meals can be shared. With a captivating lighting piece and tufted seating, the cozy corner looks straight out of the movie. According to the suite's Airbnb page, the merchandise seen in the space are imported from Warner Brothers and Universal Studios. 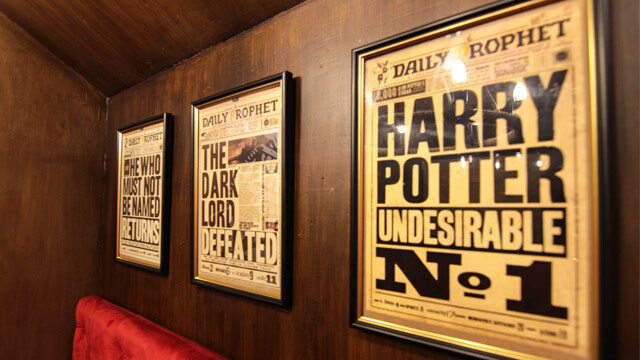 In the dining nook, framed copies of The Daily Prophet, the wizarding world's newspaper, spruce up the walls. 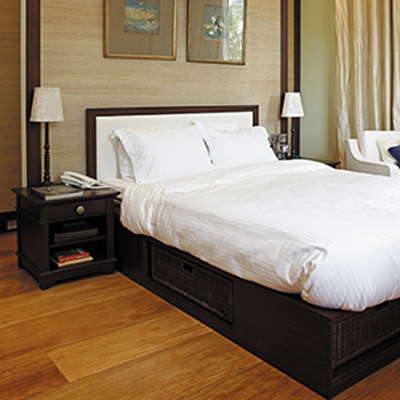 The first things guests will notice are the finishes, furniture, and décor completing the living area. 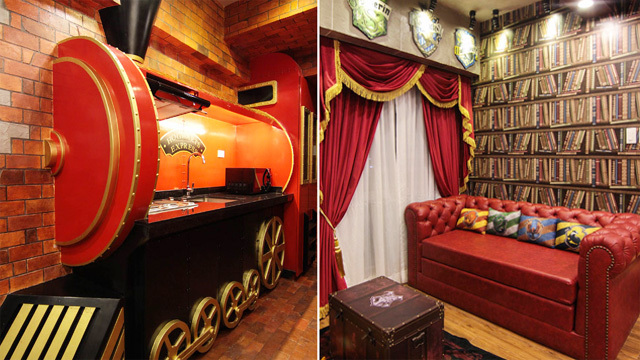 "It's made to look like the Gryffindor common room, with bookshelves, a fireplace, and a sofa," shares the creative director. What we love best in the living area is the chosen wallpaper that shows shelves filled with books. It looks real and matches the theme of the suite. To match the color palette, the design theme chose a tufted sofa bed in the living area with nailhead trim. A chest in the middle functions as a center table. 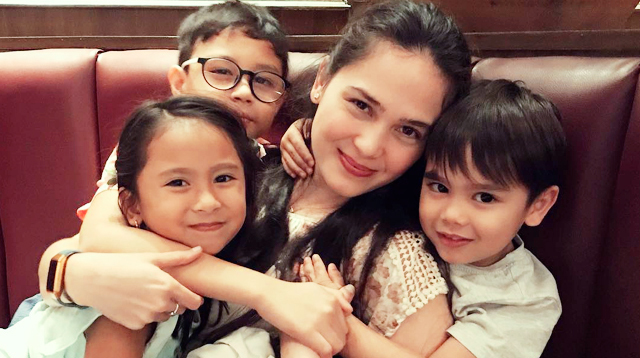 Find a similar piece at Mandaue Foam, 489 Shaw Boulevard, Mandaluyong City. 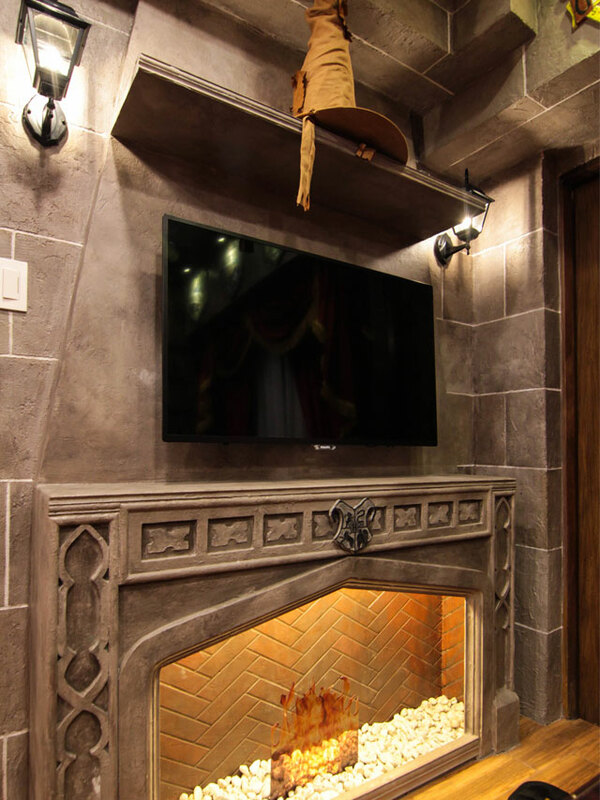 Decorated with a sorting hat and matching wall lamps, the wall holding the TV also features a faux fireplace with an interesting detail that will remind fans of Harry Potter and the Goblet of Fire. "There was a scene in the common room wherein Sirius Black appeared to Harry through the fireplace, hence the detail we added," Gila shares. The details that complete the living area are amazing, from the flames to the herringbone pattern seen at the back. 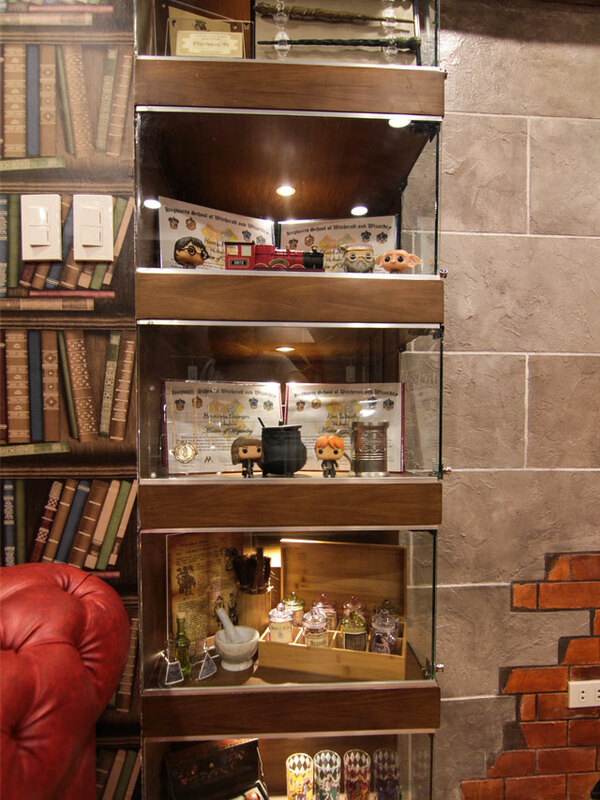 A display shelf filled with collectibles, wands, toys, and other memorabilia completes the living area. The shelf has mini spotlights inside to highlight the prized collection. 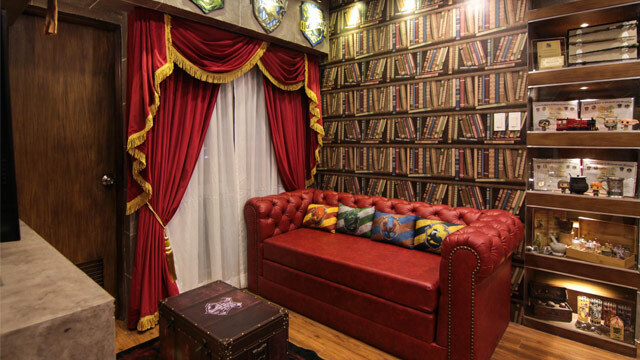 "If you want to go and achieve the Harry Potter theme, you cannot go wrong with gray stone works, brick wallpaper, maroon and gold curtains, and wooden furniture. 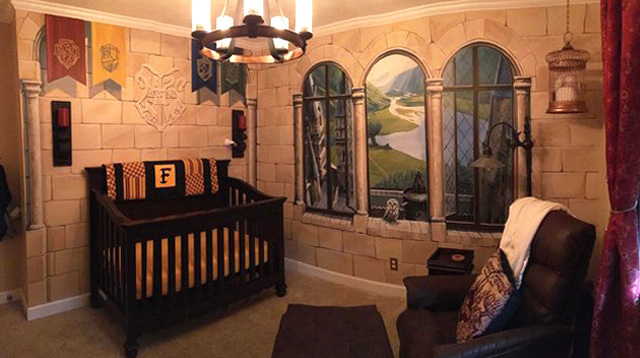 An image of the Hogwarts Crest anywhere in the room wouldn't hurt either," suggests Gila. To make sure even the storage ties in with the overall look, the doors of the cabinets look like the trunks used by the students in the film. 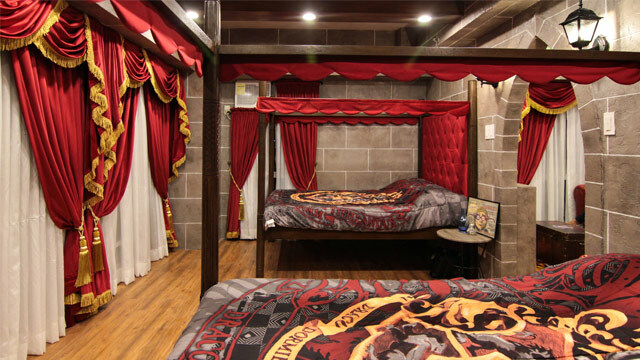 Welcome to the Gryffindor dorm room. The master suite with two four-poster beds showcase gold and maroon curtains, a gray stonework wall, and of course, Harry Potter bed linen. The wall and flooring finishes add to the snug appeal of space, transporting guests into a faraway castle. 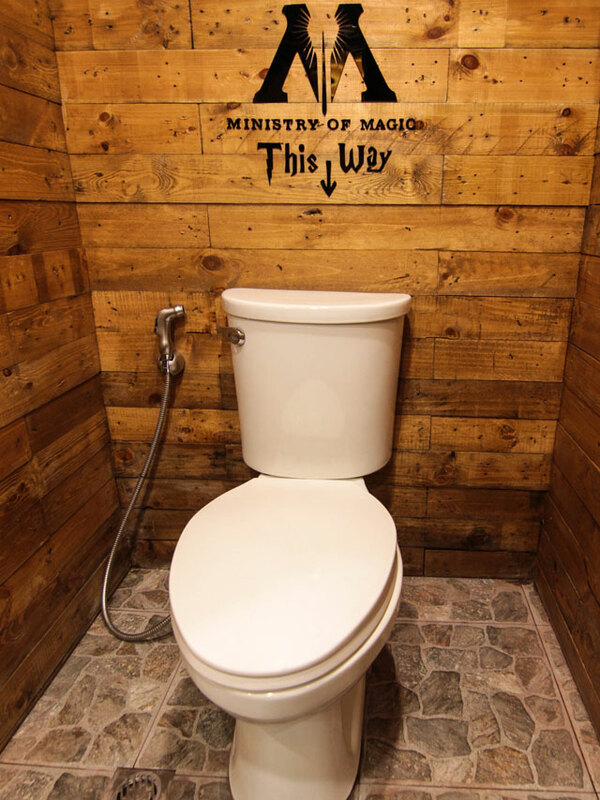 If you've read the books and seen the movies, you'll know about the toilet network as mode of transportation used in the Ministry of Magic. To reflect this in the bathroom, the design team added a wall decal. "Since the unit had gray and dark accents, I wanted the bathroom to be a little bit warmer. I took inspiration from Hagrid's Hut and the Weasley house for this look," shares Gila. 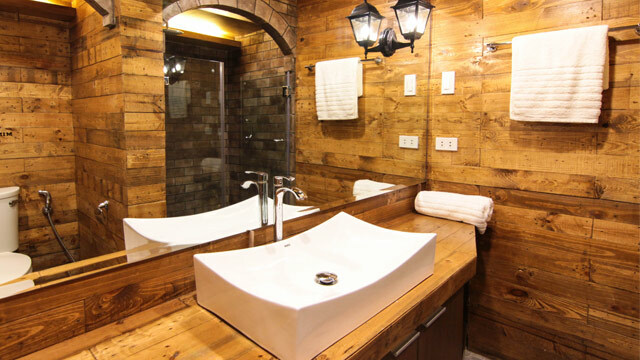 Wooden walls and a spacious wooden counter dominate the bathroom and give it a cottage feel. 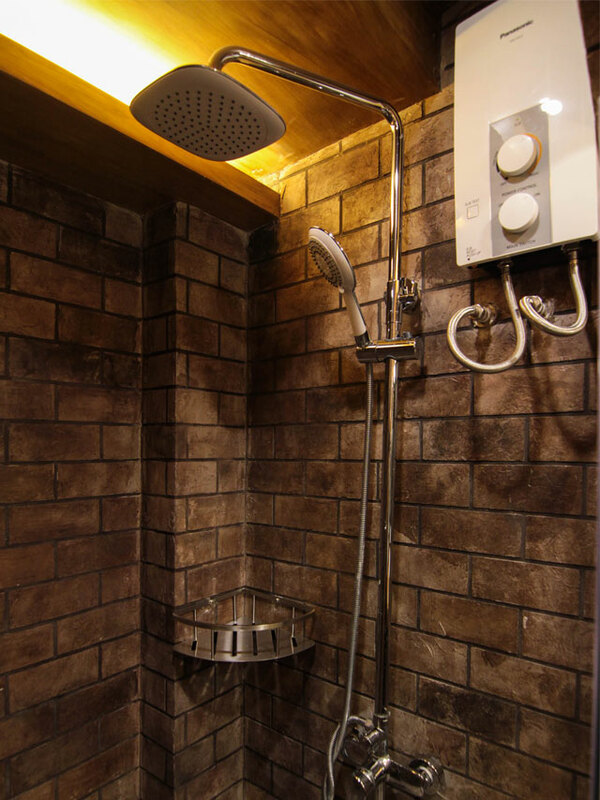 To create contrast, the shower area has darker walls paired with topnotch fixtures. 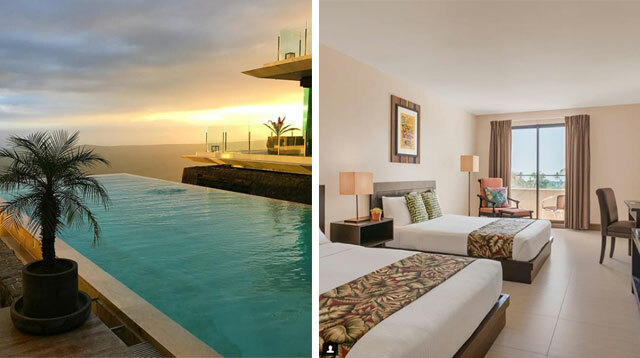 To learn more about this suite and how you can book it for a vacation, click here. 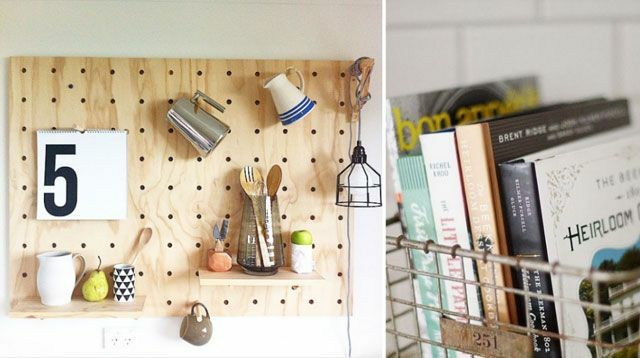 Ready for your own home makeover? Follow Madhouse Design Studio on Facebook.